Much has been written of late about the costs of inequality — the social and health costs, the costs to democracy and social cohesion, and the costs to the economy and productivity. But here’s another cost to rising inequality that has received less consideration — the costs to our climate. Many doubt that the task of rising to the climate challenge will be undertaken in a manner that is fair and equitable, and the effect on public trust is corrosive. While we may not confront a values gap or even an insurmountable information gap with much of the public, we do face a “faith” gap: a lack of faith in our public institutions; a lack of faith in our collective capacity to rise to this challenge; a lack of trust that politicians are up to the task (or a belief that our governments are captive to corporate interests and “the 1%”). There is a “chump factor” at play. No one wants to feel like they may make great efforts to reduce their household GHG emissions, only to have wealthy households buy their way out of change, or similarly, that households overall will undertake such actions, only to have industry swamp their best efforts. Such feelings are understandable. At a broad level, Canadian household emissions have been slowly dropping in recent years, even as Canada’s overall emissions keep rising. The reason, primarily, is that the expansion of Alberta’s tar sands cancels out all other efforts to do the right thing. It is a reality that can reasonably lead people to give up trying in frustration. These sentiments also emerge from inequality between households. 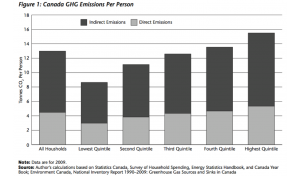 For example, Climate Justice Project research by Marc Lee notes that Canadian household carbon emissions are highly unequal. As the chart below shows, the wealthiest 20% of Canadian income earners are responsible for almost double (1.8 times) the GHG emissions of those in the poorest 20%. Meaning, even if the richest Canadians successfully reduce their household emissions by 30% by 2020 (BC’s current legislative target for the province as a whole), they will still be emitting more than the poorest 20% of households do today. This exposes a fairness challenge, and suggests that higher-income households should bear a greater burden of reducing emissions. It also demonstrates that inequality is not only a moral problem — it is a practical one in terms of getting to carbon-neutral. Runaway wealth is associated with runaway emissions — the 1% represent a climate problem. High levels of inequality also undermine social cohesion, rather than building the social and political trust needed if we are to chart a future based on a shared sense of fate. Conversely, among the many important findings in the work of British epidemiologists Richard Wilkinson and Kate Pickett, is that societies with less inequality are also more open to embracing environmental actions. All of which leads to a key lesson — policies must be seen to be fair. If climate policies are not perceived as fair, public support will not be sustained, and political determination will wane. Poverty and inequality will be exacerbated by climate policy, unless this reality is explicitly taken into account and inequality mitigation measures are built into the design of climate action measures. Almost all climate policies, taken in isolation, have the effect of increasing prices, with a regressive distributional impact. This is not a reason not to proceed. Rather, it means that redistribution measures – both within and between states – must be core to climate action agendas. Policy design flaws such as this should have been fixed, but the government refused. Consequently, a policy measure that should have benefited from widespread support was instead a source of considerable resentment and political backlash, leaving politicians reluctant to take further (and necessary) bold action. • Beetles, forests, and climate change: Exchanging old mistakes for new? Yes, let’s lower the voting age in Canada.